Neck headache which is also known as a cervicogenic headache is a headache that is due to issues in the bony structures or other structures in the neck. It is also known as a secondary headache which means that the problem is caused by another illness or possible issues. Clinical studies have also confirmed that the pain from the cervical (neck) spine can be referred to the head. A cervicogenic headache can be a perplexing and difficult problem that may be refractory (unresponsive) to treatment if it is not diagnosed. The prevalence of a neck headache in the general population is estimated to be at 0.5% to 4% but may be as high as 20% among patients who presents with severe chronic headaches. The mean age of patients with this disorder is approximately 43 years and is found to be more common among women. Common causes of a cervicogenic headache include poor posture, arthritis, trauma (due to sudden forceful movement of the head and neck such as in road traffic accidents, fall or athletic collision). A cervicogenic headache may also be due to the joints of the neck being stiff, sore and inflamed causing the surrounding nerves to become irritated and pain is referred to the neck, shoulder, head, face and behind the eye (retro-orbital). Studies have found that specific neck positions and those with occupations such as hairdressers, carpenters, and truck drivers have been linked to a higher risk of a cervicogenic headache. As mentioned, women are also more prone to develop this disorder. 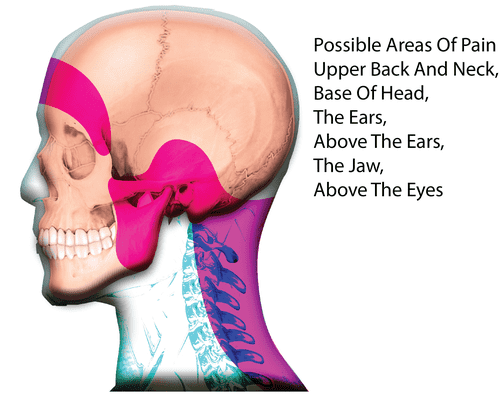 Patients most commonly present with pain that radiates from the neck to the sides and front of the head. This pain can also be reproduced with certain neck movements. Patients will also commonly have tried many other remedies such as medication and massage but the pain has always persisted (pain is relieved but comes back). The diagnosis of a cervicogenic headache can be made through the patient’s history and examination of the patient. Diagnostic imaging such as computed tomography (CT) scan and magnetic resonance imaging (MRI) scan can be used to aid the diagnosis by ruling out other causes of pain. Grade A: Pain referred from a source in the neck and felt in one or more regions of the head and/or face, fulfilling C and D.
Grade B: Clinical laboratory and/or imaging evidence of a disorder or lesion within the cervical spine or soft tissues of the neck known to be, or generally accepted as a valid cause of a headache. Grade D: Pain resolves within 3 months after successful treatment of the causative disorder or lesion. There is no specific treatment that has been proven to be effective.Management of a cervicogenic headache comprises of a comprehensive multidisciplinary pain treatment program as it has the best chance for overall clinical improvement. The oral medication that has been found to be effective for patients with chronic episodes include analgesics, tricyclic antidepressants, and anticonvulsants. Physical therapy may also be a better option for long-term improvement as it most often produces the best outcome. Patient education is also important as it will help to relieve pain and assist with patient compliance to maintain good posture. Taping techniques can also be used to assist in postural awareness and for pain relief. Strengthening exercises will also be a part of physical therapy. The combination of physical therapy, patient education on posture and strengthening exercises has been proven to be effective in the treatment of cervicogenic headaches. It was found that conservative therapy after six weeks achieved positive long-term outcomes and provided the patients with enough education and awareness to reduce the risk of recurrence. Although the cause of a cervicogenic headache is easily understood, it is a challenging disease to many healthcare practitioners as there is still a lot of controversy regarding this topic. It may be a relatively common cause of a chronic headache but it is often misdiagnosed or unrecognized. With early diagnosis and management, healthcare providers can help patients to significantly reduce the pain and disability that is associated with cervicogenic headaches. Becker WJ. Cervicogenic headache: evidence that the neck is a pain generator. The Journal of Head and Face Pain. 2014; 50(4):699-705. Biondi DM. Cervicogenic headache: a review of diagnostic and treatment strategies. The Journal of Aerican Osteopathic Association. 2005; 105(4):16S-22S. Evers S. Comparison of cervicogenic headache with migraine. Cephalgia. 2008; 28(1):16-17. Sjaatstad O. Cervicogenic headache: comparison with migraine without aura; Vaga study. Cephalgia. 2008; 28(1):18-20. Haldeman S, Dagenais S. Cervicogenic headaches; a critical review. Spine. 2001; 1:31-46. Heath J, Goulet N. Cervicogenic headaches: a pain in the neck. Drayer Physical Therapy Institute. https://drayerpt.com/cervicogenic-headaches/ Accessed 1/21/2017.